What do you do if you loved your little Toyota Matrix hatchback and want to get a new one, only to sally forth to your local Toyota store and find that, like the Pontiac Vibe with which it shared its DNA, it's no longer available? Well, you could check out the Corolla iM, which right now is the closest thing Toyota offers to that great little wagon. 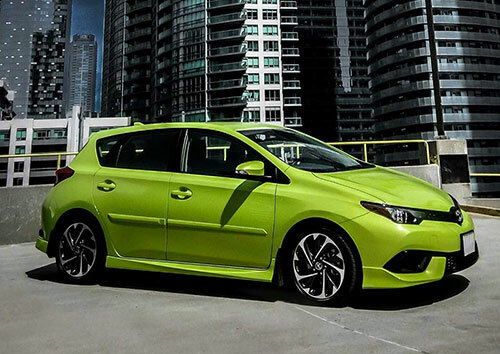 It started life as the Scion iM, but once Toyota decided to say sayonara to the Scion era (sorry…) it dumped all that line except for this little hatch and the wonderful little FR-S sports coupe that's now known as the 86. The iM isn't going to set the world on fire, but during my week with it I actually fell under its spell, kind of. Oh, I had issues with it, especially when it came to its oomph output with four adults on board, but overall, I could live easily with an iM if it fit my budget and lifestyle. It's a nice little car. The iM is pretty loaded right out of the box, kind of like a couple of friends of mine, the only option available being the CVT transmission - which adds about $800 to the car's base price. If you really want the driving experience – such as it can be with a little wagon that oozes only 137 horses onto the road via its front wheels – you should opt for the base model, with its six-speed manual. Otherwise, you get the CVT, a transmission that always rubs me the wrong way. Well, nearly always. I was astounded – pleasantly – to discover that if you slip the iM into Sport mode via the button on the centre console, that damn CVT suddenly starts "shifting" as if it were an honest to goodness automatic transmission. It's still loud, but the fake shifting elevated the driving experience from "meh at best" to "pretty good, all things considered." That may not seem like high praise, but considering how I feel about Continuously Variable Transmissions, it is. It even has a reasonable "manual" mode, though no paddles. As noted above, however, the six-speed stick will probably add a lot of fun and driver connection to the iM, so (to rip off a pun I used in my Scion iM review from a couple of years back) if you prefer your car to come through in the, well, clutch, then this is your vehicle. iM's motivation comes via a 1.8 litre inline four-cylinder engine. As mentioned, the power is just fine for a vehicle in this niche, though during my week with the iM some buddies and I sallied forth to a town about 90 minutes from Chateau Bray, to rubberneck a classic car show, and the extra weight meant I had to plan carefully any passing of other vehicles. That said, if you have younger kids and have had your lead foot removed surgically, the iM should serve you just fine – and it wasn't as if we had to get out and push the iM when we wanted to pass. In other words, it was no worse than most cars in this niche. I passenged in the back seat on the trip home and found the rear seat just fine for two adults, with good foot and leg room and a reasonably comfortable seat cushion. The car's structure is reasonably tight and nimble and the independent suspension (double wishbones on the rear) is tuned nicely and the handling is a lot more sporty than I expected. iM's come with such stuff as 17-inch alloy wheels, automatic headlights (which I think is something every car sold today should have), LED daytime running lights and taillights, and an intermittent rear window wiper/washer (for those with intermittent rear windows). Inside, there's a 60/40 split/fold rear seat, dual zone air conditioning, all season floor mats, a backup camera (something else I think every vehicle sold today should have), cruise control, illuminated vanity mirrors, power windows (with auto up/down for the driver) and door locks, remote keyless entry (via the fob), heated "sport" bucket seats up front and a tilt/telescoping steering wheel with redundant audio controls on it. You also get a seven-inch touch screen, Bluetooth (another thing every car should have these days, and most do), USB Port, six speaker audio (and it's a reasonable system for a stock Toyota stereo), with Aha Radio, voice recognition (well…), integrated Gracenote database and an auxiliary audio jack. Most of this is available on other cars in this class, of course, but not necessarily as standard equipment. What might not be available as standard equipment on competitors is stuff like Toyota's standard Safety Sense stuff (active safety technologies including a Pre-Collision System, Lane Departure Alert, and Automatic High Beams) as well as the Toyota Star Safety System of eight air bags, a back-up camera, whiplash injury-lessening headrests for the front seats, tire pressure monitoring and more. It all adds up to a decent little wagon/hatchback that's also quite interesting to drive. Sure, the car at heart is a fairly bland Toyota, it's better than you might expect and it's priced reasonably. I call that a winning combination. The 2018 Toyota Corolla iM is offered in only one, but quite loaded, model. The only real choice is which transmission you want: the stick version starts at $22,650 and the CVTi-S starts at $23,485.